Jim Morrison “opens” the DOORS! A well know poet and a DOOR member Jim Morrison was born as today December 8, in 1943. With his real name, James Douglas “Jim” Morrison, was born in Melbourne, Florida, to future Rear Admiral George Stephen Morrison and Clara Morrison. He was of Irish and Scottish descent. Recognized as an American singer-songwriter and poet, best remembered as the lead singer of Los Angeles rock band The Doors. Following The Doors’ explosive rise to fame in 1967, Morrison developed a severe alcohol and drug dependency that culminated in his death at the age of 27 in Paris. He is alleged to have died of a heroin overdose, but as no autopsy was performed, the exact cause of his death is still disputed. Morrison was well known for improvising spoken word poetry passages that he was often performed while the band played live. Due to his wild personality and performances, he is regarded by critics and fans as one of the most iconic, charismatic and pioneering frontmen of a group in rock music history. Morrison was ranked number 47 on Rolling Stone’s list of the “100 Greatest Singers of All Time”, and number 22 on Classic Rock Magazine’s “50 Greatest Singers In Rock”! In December 6, 1939 , a musical, with music and lyrics by Cole Porter, premieres in New York City. The musical DuBarry Was a Lady opened on Broadway at the 46th Street Theater, transferred to the Royal Theater on October 21, 1940 and closed December 12, 1940, after 408 performances. Giovanni da Verrazzano (1485–1528) was an Italian explorer of North America, in the service of the French crown. He is well-known as the first European since the Norse expeditions to North America around AD 1000 to travel and explore the Atlantic coast of North America between the Carolinas and Newfoundland, including New York Harbor in 1524. The bridge over the opening of New York harbor is among his several eponymous tributes. But the bridge’s truss is erected in 1963. The final price tag for the 2.2-mile-long span – at the time, the largest suspension bridge in the world – was placed at $32 million. In August 1964, the upper deck of the bridge was paved, and as today, on November 21st 1964 the bridge was officially opened to the public. 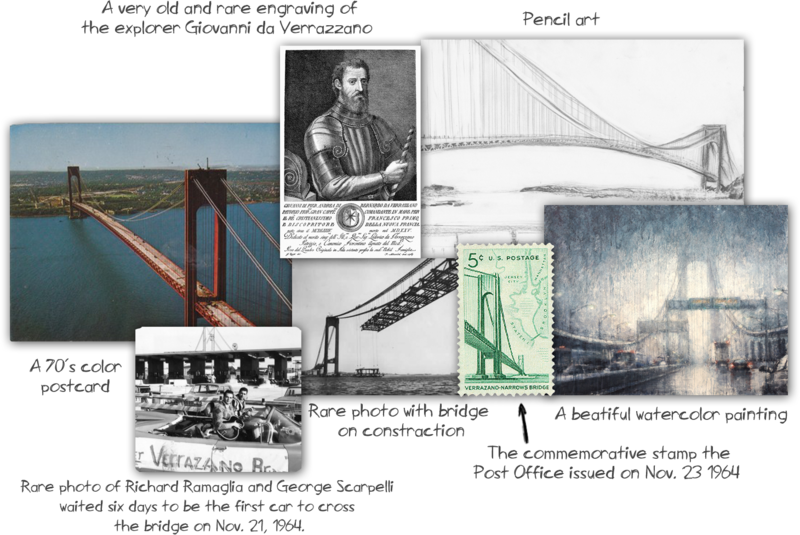 On Nov. 23, the Post Office issued a commemorative stamp featuring the Verrazano-Narrows Bridge. You can find a lot of paper memorabilia about the bridge; accurately about any bridge! There are many collectors with bridge thematic collections of stamps, art, postcards or engravings!